A business is like the heart. 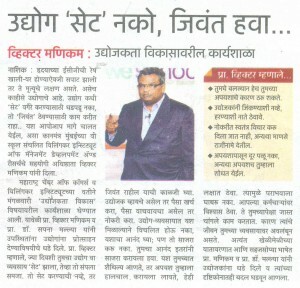 So, do not try to ‘set it’ instead take efforts to keep it ‘alive’ and the success will follow you automatically, said WeSchool’s co-dean Victor Manikam. He was speaking in a entrepreneurship development workshop organized jointly by Maharashtra Chamber of Commerce and WeSchool. Prof Victor Manikam & prof Sapna Malya were the speakers. Prof Victor further said,” Your business will end on the day when you will feel that your business is set. Spend money to become businessmen and become an employee to save money”. He also instructed that the mindset of businessmen should not get diverted with success. Enjoy success but do not celebrate it! Let others celebrate your success. Success brings relaxation while failure keeps you active so, don’t be afraid of failure.